Plus, A Great Place For Napping! Small dog crates have many useful purposes. The most obvious of course is for housebreaking, but they are also of great help in lots of other ways outside of training. For example, they are ideal when traveling - either by car or by air. On the road, dog travel crates, carriers or small kennels are an ideal safe place for your dog while on the ride and also makes it easier for checking into hotels. Plus your pet has his own familiar sleeping quarters at the end of the day. Dogs that are provided a crate from an early age at home will quickly come to view it as their "den" and will happily go into it at almost any time. In unfamiliar surroundings most pets are a little nervous and the crate comes into its own as the perfect refuge. Inevitably, all dogs have to visit the vet for one reason or another - and if you have a little dog that's when small dog crates come into their own! Pet owners who planned ahead for these fearful occasions will be thankful for having a crate at hand! Many dogs get nervous just being in the vet's waiting room! And if the pet is injured, then it becomes even more necessary to keep him or her as calm and still as possible. Crates are also a boon when picking up pets after surgery, or any medical treatment requiring anaesthesia. Being protected in their den is less stressful and gives them the necessary quiet time to recover. And when you have a new dog you are house training, it very convenient to have a crate by your bed. It also helps a new pet feel more secure when their master is nearby. When selecting a small crate, the size should be big enough for the pet to lie down with legs outstretched, stand up, and turn around. But, if crate training a puppy, it should not include extra space that could be used as a bathroom. Luckily, adjustable crates can be found with handy dividers to temporarily block off extra space and then later removed as a puppy grows. This is the ideal crate for introducing your pet to concept of having his own den. It is also, without doubt, a must for shortening the time it takes to accomplish house training. You'll see! Once a pet is on a regular feeding schedule, it's easy to keep track of the times of day when he usually needs a potty break. As a result, his time in the crate will be very limited, but serves to help reinforce the training. Pretty soon, his crate will become a place where he will enjoy hanging out or just pop into for a quick snooze. Transform your pet's classic crate into something extra cozy and attractive with one of these crate covers. Here's a hand-picked selection of above-average designs to get you started. Find the perfect one to pamper your special pet as well as compliment your home decor. Some pet owners are just looking for a multi-purpose dog crate to use around the house, so we've included some of the those in our collection below. Decorative crates that resemble furniture offer a practical solution when space is limited - a unique crate for your pet that fits in with your decor. Do you have any airline travel plans in your future? No need to leave your furry friend behind. 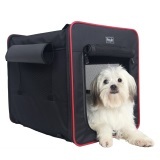 Small dog crates can be used when flying to a destination. Many airlines allow passengers to have small pets with them in the cabin providing they are in airline approved dog crates or carriers. Larger pets can travel in climate controlled cargo areas, where a plastic dog crate is usually preferred. Scroll through this page to find a crate to meet your needs and click on any item you like for more detailed information, or to purchase. We hope you'll find the ideal crate you're looking for and one that your little dog will come to love!